If you've been holed up in an elaborately guarded complex someplace, you might not have run across the Nigeria 70 series of releases from Strut. It started with Nigeria 70: The Definitive Story of 1970's Funky Lagos in 2001; then Nigeria 70: Lagos Jump: Original Heavyweight Afrobeat Highlige & Afro-Funk in 2008. 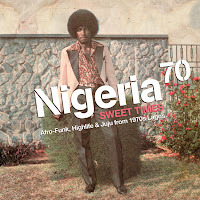 Next week, the third installment arrives, entitled Nigeria 70: Sweet Times: Afro Funk, Highlife And Juju From 1970s Lagos.